I get design inspiration from all over the place. Sometimes it’s obvious and makes perfect sense. Other times something almost unnoticeable will sit in the back of my brain and wake me up in the middle of the night in a fit of creativity (that’s fun, but I definitely lose sleep). Designing nurseries means that I’m usually looking for ideas that will translate into youthful spaces, but it does not mean I don’t still find inspiration in all sorts of things. I just have to tweak them a bit more in my mind. 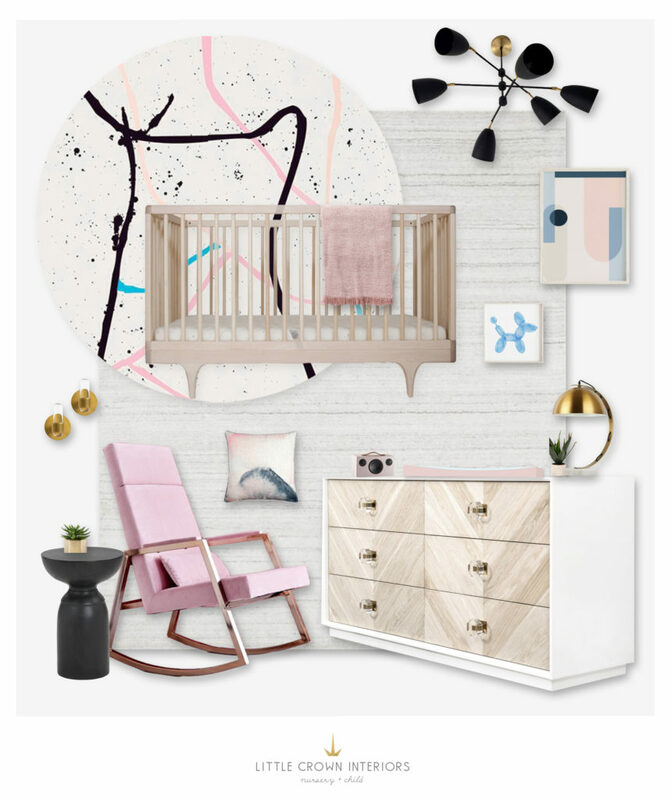 One of my favorite places to look for nursery inspiration is actually just regular “adult” interior design (and of course, by “adult”, I just mean non-juvenile). I tell my clients this too—they don’t have to be limited to inspiration photos of nurseries. We can pull inspiration and design elements from almost anything. Recently I came across the photo above of a room designed by Drop It Modern showcasing their wallpaper. Instantly my brain translated it into a nursery design. The pink velvet chair could so easily be a pink velvet glider. The light wood dresser could be a light wood changing table. There’s no crib in the photo, which means my imagination just gets to choose one. The wallpaper is already so whimsical and fun! I’m sure you can guess what happened after that. That’s right—I woke up in the middle of the night unable to stop the design from forming in my mind. The next day, I put a nursery design board together. Don’t worry, I won’t leave you without all the sources for this. And they are pretty great! (Unfortunately that pink rocker is already discontinued). These types of design boards are exactly what I do for my E-Design clients. So if you’re looking for professional help designing your nursery, I’ll create one just for you.